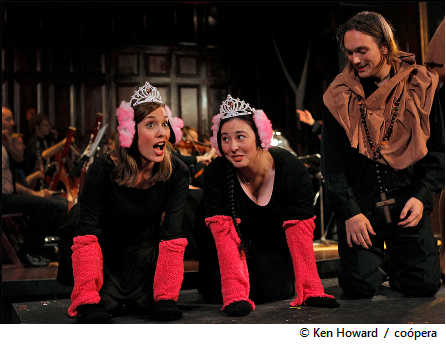 The rarely performed Hal Prince adaptation of Bernstin's Candide was presented to great critical acclaim at packed houses in the beautiful dining room of The Players on September 23 and 25, 2011. Directed by The Players' Executive Director, John Martello (who also took on the roles of Voltaire, Pangloss and Governor), the opera was conducted by Jorge Parodi, who led a 13-piece orchestra. The cast included Evan McCormack as Candide, Rosa Betancourt as Cunegonde, Laura Virella as the Old Lady, Jorell Williams as Maximilian, Sophia Benedetti as Paquette, and an array of characters brought to life by Dorian Balis, Meagan Amelia Brus, Scott Power Elliott, Monica Akemi Hershenson Thuris, Aaron Mor, Gerad O'Shea, Tricia Ostermann, Christine Price and Gregory Spock. Metropolitan Opera photographer Ken Howard fell in love with the production designed and executed by Tricia Suriani and Tyler Learned, and did us the honor of shooting for us one more time. The photos will soon be available for purchase on the web. This production was funded in part through Kickstarter, by the power of many. You may see the project video here. For more production clips, susbcribe to our YouTube Channel or "like" us on Facebook. You can also follow us on Twitter.